It was an honor to be present at Norm Furutani’s "Recognition of Retired Band Teacher " plaque ceremony. I had the privilege of saying a few words on his behalf; however, what I truly wanted to say didn’t come to me until this event was over. What I really wanted to say was Norm Furutani is a nice man who comes from a good family. I met him in 1996 when I became President of the PTSA. Four of my children had the good fortune to learn under his instruction. Mr. Furutani, as I always called him, took great pride in his students. He was like father image to many of the them and they respected him as such. I think it’s important to point out that Norm Furutani taught at a very difficult time when the Centinela Valley Union High School District was unstable in a fiscal management crisis with changes in leadership at both the school and district levels. Despite the financial hardship, he always made sure the students had everything they needed. He even supplied money for students who were performing and needed accompaniment. He took the students every other year to Santa Maria and also every year to Disneyland. He took the responsibility to raise funds when there wasn’t enough money in the budget. He took all his equipment including a trailer once so that the firework's stand would be safeguarded. I always felt that someone was watching out for him because somehow help would come his way. He was truly there for his students. He was a good role model and kept them disciplined. I often heard stories of students toilet papering his house. They would play mischievous tricks on him. Those are the same students who were always there to help him out and would never want to leave the band room. Most of the students wouldn’t be where they are today without his instruction. He treated his students as if they were his very own children. When my children were under his supervision, I knew they were in good hands. He set high standards and morals for all his students. He had a calm way of disciplining them. He’s a good friend. When I need something for the school, he is always eager to help. Thank you Mr. Furutani for being the person that you are! 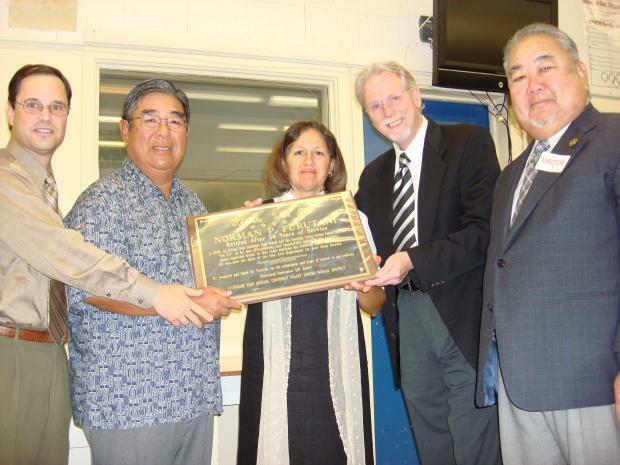 In Leuzinger High School's band room, a plaque was dedicated to Norm Furutani in honor of his many years of service. In attendance were (photo r-l) Interim Superintendent Jose Fernandez, Norm Furutani, CVUHSD Vice President Sandra Suarez, Leuzinger's Interim Principal Jim Jobes, and brother Warren Furutani.